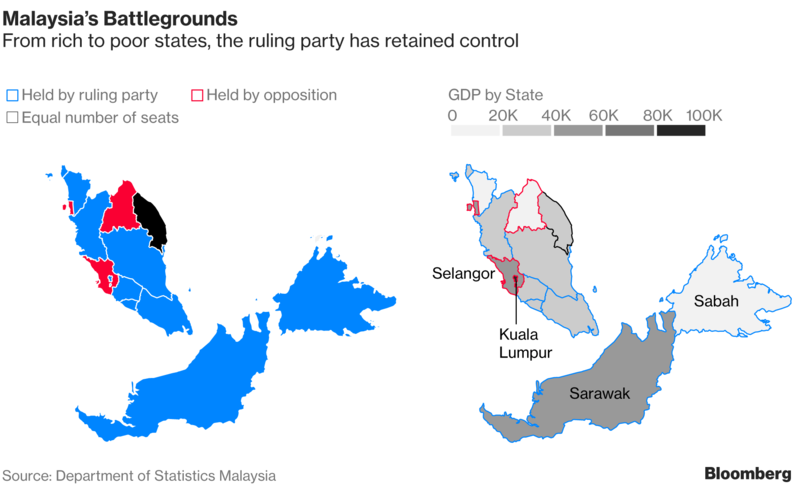 Malaysia is preparing for a general election. How will this affect the Malaysian economy? First, let us take a look at how the Malaysian Economy has transformed over the years. Malaysia’s economy ranks 5th among Southeast Asia and 35th among the world. As reported in the Global Competitiveness Report 2017, the economy of Malaysia is the 23rd most competitive country in the world within the period of 2017 to 2018. From an economy dominated by the production of raw natural resources such as tin and rubber in the 1970s, to the world’s 2nd largest exporter of palm oil products after Indonesia, Malaysia today has a more diversified economy. Over the years, Malaysia has also became a leading exporter of electrical appliances, electronic parts and components and natural gas. The Malaysian economy is highly robust and diversified with its 2015 export value of high-tech products standing at 57.258 billion USD, the second highest after Singapore in ASEAN. After the Asian financial crisis between the period of 1997 to 1998, Malaysia continued to post solid growth rates, averaging 5.5 percent per year from 2000 to 2008. In 2009, Malaysia was hit by the Global Financial Crisis, but recovered rapidly, posting growth rates averaging 5.7 percent since 2010 (World Bank September 2017). The recent 2015 oil supply glut and oil price collapse further prompted the shift away from heavy dependency on oil and commodity exports to a heavier emphasis on high-tech manufacturing and the digital economy. The government has also introduced the 6% Goods and Services Tax (GST) to reduce fiscal deficits and meet federal debt obligations. Malaysia’s short-term economic outlook remains favourable, reflecting a well-diversified and open economy that has successfully survived external shocks. Domestic demand is expected to continue anchoring economic growth, supported by continued income growth and a stable labour market, while an improving external environment would contribute positively to the demand for Malaysia’s tradable goods and services. Accelerating structural reforms to increase public sector performance and improve the productivity of public spending will be critical to preserving a robust growth in a challenging external environment. Over the last 25 years, Malaysia’s labour productivity wage growth underperformed multiple global and regional competitors although it was substantially higher than that of Indonesia and Phillippines. Stimulating productivity growth would be the main contributing factor for Malaysia to converge with high-income economies since factor accumulation is predicted to slow down. It is critical that Malaysia expedites its productivity-enhancing reforms to improve the quality of human capital and increase competition in the economy so that Malaysia can advance through the value chain of manufacturing. This will help Malaysia to move out of its current middle-income position and join the ranks of high-income economies. According to the Constitution of Malaysia, the 13th Parliament of Malaysia will face an automatic dissolution on 24 June 2018 (five years from the first meeting of the 13th Parliament of Malaysia held on 24 June 2013). The legal voting age in Malaysia is 21. However, it is not compulsory to participate in the election votings and Malaysia does not practice automatic voter registration. The Malaysian Election is organised by the Election Commission which is held under the Prime Minister Department’s Jurisdiction. When will the election take place? The 14th Parliament of Malaysia will be elected before 24 August 2018. But exactly when? Well, Prime Minister Najib Razak gets to decide on that. Exports growth, stronger consumer spending and a pick-up in manufacturing saw Malaysia’s economy growing faster than forecast in 2017. Najib’s Barisan Nasional (BN) is expected to continue to target young Malaysians, rural Malays and government employees. Economic “feel-good” factors like final Q4 GDP and State Pension Fund full-year dividend announcements, civil servant bonuses had all come through by February 2018. Strengthening Ringgit, stock market and an average 9 percent monthly wage rise since April 2017 are other reasons for him to strike while the iron is hot. As Chinese New Year has just ended, it is also a good time to reach out to the minority Chinese whose votes over the last two elections swung to opposition party’s Democratic Action Party (DAP) instead of the BN’s coalition’s Malaysian Chinese Association (MCA). Moreover, ex-opposition leader Anwar Ibrahim (who has formed an alliance with ex-PM Mahathir Mohamad) might be eligible for early release in April or May. Anwar is known for his embracement of equal rights, pious anti-corruption stance and criticism of discriminatory, pro-Malay policies. He has relentlessly vowed to remove Najib from power for the 1MDB scandal and other corruption allegations. In the meantime, as an investor, how can you gain exposure to the Malaysian market? Have you heard of the product called Contracts for Difference (CFD)? CFDs can be used as a hedging tool for your portfolio in times of uncertainty. Moreover, with CFDs, you can take on short positions and not be limited to the T+3 days contra period. As we continue to monitor the advancement of the upcoming Malaysian Election, you can gain exposure to both potential upside and downside to the Malaysian market through CFD trading. You can hedge your positions with our FBM KLCI MYR10 Index CFD. Alternatively, if you are bullish but uncertain on which counters or sectors to buy, you can long our FBM KLCI Index CFD. Log in POEMS2.0 to trade now! That’s all for now. In the next article, we will take a look at the contenders and their manifesto. Do keep a lookout for our next article! All of us have different reasons as to why we started investing. Some of you might have read my previous article on “3 Reasons To Start Investing… NOW!” and in it, I mentioned about compound interest…. You have an up-trending counter. You know that the price has corrected and is forming a lower high. But when is the right time to purchase a share? One way to do it is to use candlestick patterns.